Travertine is one of the most durable natural stones known to man, and has been in use for thousands of years. While the historical way of shaping the stone was with a hammer and a chisel, modern day advancements have allowed the use of tools such as tile wet saws and angle grinders. While a tile wet saw is ideal for making straight cuts, a variety of corner cuts as well as angle cuts and holes for drains are more easily accomplished with a common angle grinder. Cut your travertine around difficult areas with an angle grinder. Cut the travertine to fit around heater vents, cabinet corners, doorways, electrical outlets or other square areas and receptacles with an angle grinder. Mark the finish surface of the stone and use the lines as a reference, but only cut as far as the outer edges of your cut. Flip the stone over and cut the remainder of the stone from the back side, with the notches from your top-side cutting as a reference. 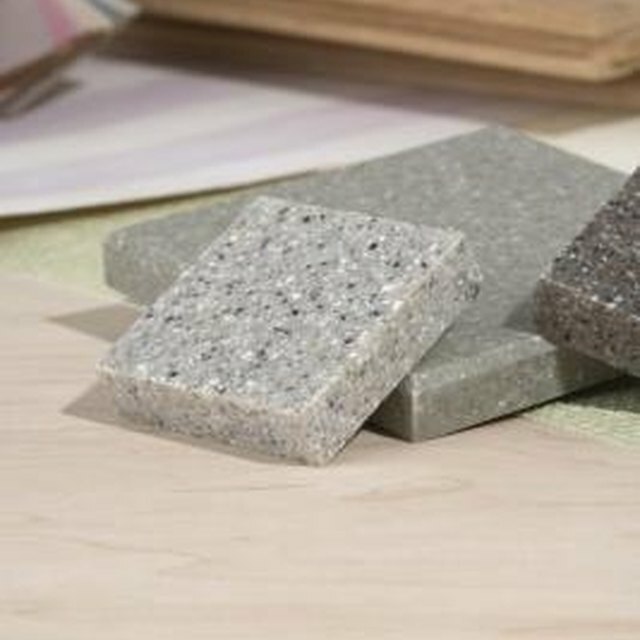 Place your piece of travertine on a cutting surface, such as a plank of wood or whatever your chosen platform. Hold the grinder with both hands at an angle comfortable for you with the blade vertical against the face of the stone. Pull the trigger for the angle grinder and press the blade down into the stone. Cut to the edges of your mark, then flip the tile over and cut from the backside to remove your cutoff completely. Shape the travertine around drains, toilets or other receptacles that are round. Hold the blade in a similar fashion to straight cuts and cut away as much of the circular area as possible by cutting through the stone at straight angles until you have only a few smaller areas of the circle left. Work your way around the remainder of the circle. Hold the angle grinder so that the blade is horizontal with the finished face of your tile. Pull the trigger and slowly tilt the blade of the grinder against the face of the travertine so that the blade is roughly at a 45 degree angle to the finished face. Ease the circular edge of the blade into the surface at an angle so that the edge of the blade aligns with the circular marks. Work your way around the edge of the circle and continue applying pressure in a downward motion around the edge of your circle until you finish your drain or toilet cut. You can adjust the guard of your angle grinder's blade depending on how you prefer to hold the grinder, or the type of cut you need to make.